Indian recipe for kids suitable for 2 years plus This is my twist on a British classic, beans on toast. Now this fabulous curry is as quick to make as it is to warm up the can of beans used to prepare it with. It is perfect served as lunch for a 2-4 year old or as an after school snack for older children. When I served this to my little one I was anxiously waiting to hear the magic word.... 'more' (yes that's right, 'more', clearly not the magic word you were thinking of). Anyway to my delight I heard ‘more pea’s please’. Well she meant ‘beans’ but it came out as ‘peas’. 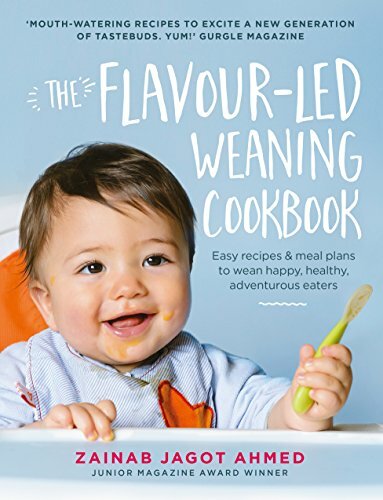 Now those of you who are regular followers of my blog, or even those of you who have a copy of my book will know that I do not add salt to any of the meals I prepare from scratch for my little one. However, since the main ingredient of this curry is ready-made, there will be some salt included within this curry, so the best option here is to opt for a can of beans that has low salt and sugar content. Although there is a small amount of salt within this curry, I like to counter it with the fact that baked beans are in fact.... SUPERFOODS! They are loaded with protein, necessary for healthy growth for children, fibre-rich, and the tomato sauce they are covered in is a source of lycopene which is antioxidant and anti-cancer. Add an extra boost of health benefits to the baked beans in the form of 'SuperSpices' and this really is a simple and nutritious snack. For example, ginger is great for digestion and well, I've already applauded mustard seeds for their fabulous health benefits. 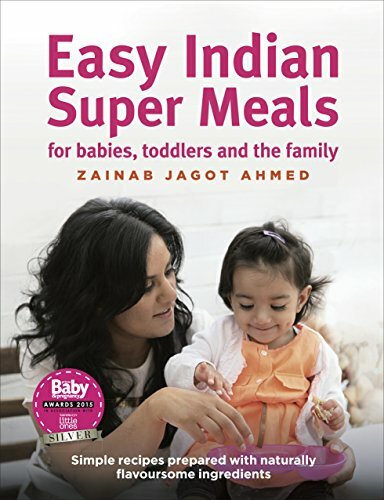 If you are concerned about keeping your child's daily salt in-take low (as I am), a great solution here is to create 2 servings from this curry and serve 1 to your little one, reducing the salt content by half straight away. In this case 0.45g based on the baked beans I am using. 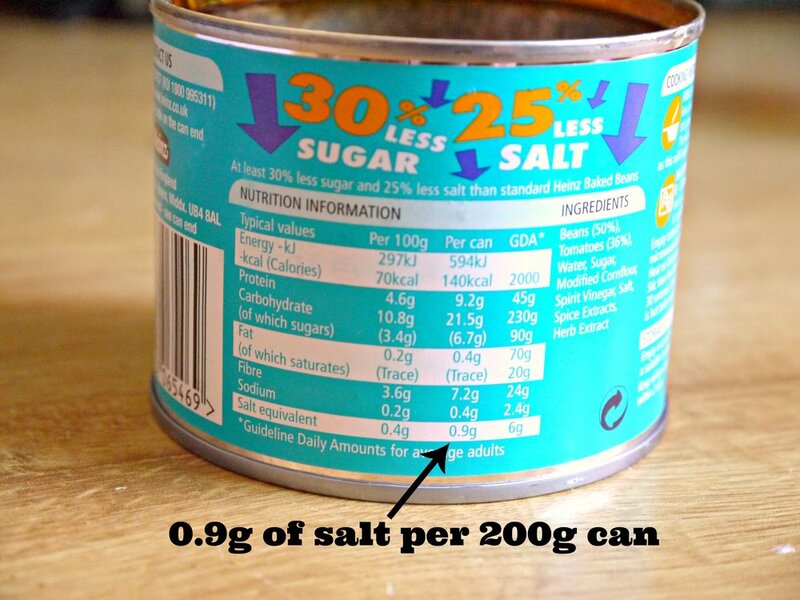 As 1-3 year old's need less than 2g of salt per day this keeps the salt in-take well within the recommended guidelines. When I do this, I also like to offer my little one a banana to finish her meal with to make sure she has a satisfied little belly. Makes 1-2 servings. Total cooking and preparation time: 6-7 mins. Heat the oil in a small pot on low heat and add garlic, mustard seeds and cumin. As soon as they begin to sizzle stir for a couple of seconds, add the baked beans and stir. This is very important as the cumin seeds can burn quite quickly. Add the ginger, coriander, turmeric and black pepper and stir. Simmer for 5 mins and it’s done! Remove from the heat and set aside. Toast some soft granary bread, butter with unsalted butter (to keep the salt in-take down), remove crusts if necessary and cut into triangles. Pour the baked bean curry over the toast. This makes the toast really soft and yummy and my daughter loves it like this as she doesn’t like toast too crispy.